April is National Autism Awareness Month and there are tons of events, conferences and fundraisers occurring across the country. To kick of the month, Autism Speaks is raising awareness through their Light It Up Blue campaign. On the evenings of April 1 and 2, prominent buildings across North America and the world — including the Empire State Building in New York City and the CN Tower in Toronto, Canada — will turn their lights blue to raise awareness for autism and to commemorate World Autism Awareness Day on Saturday, April 2. 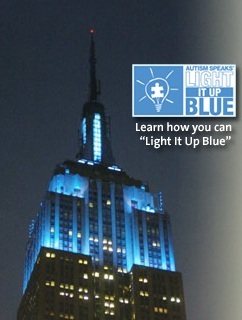 You can wear something blue, use a blue light or wear a puzzle piece to commemorate the day and raise awareness. Click here for a long list of events taking place around the world. Are you planning on participating in any events for Autism Awareness Month? We’d love to hear about events in your city or town. Make sure to check back with us on April 1 for Different Roads to Learning’s kick-off to Autism Awareness Month. Written by: Different Roads to Learning on March 24, 2011.